This lemon tart is a new favorite with the bruleed top. I am definitely investing in an actual kitchen torch so that carmelizing the top could be done a lot quicker. This cake for my brother's girlfriend was one of my most fun cakes to make to date. It's based off of the viral YouTube video featuring the Nyan Cat. True to form, I made sure to use a cherry Pop Tart for it's body which I had a friend confirm that it was definitely a cherry pop tart and not any other flavor. My favorite part was waiting for her to cut open the cake to reveal the rainbow center. I used my go to white cake recipe, divided the batter into six separate bowls, and added a few drops of dye to each bowl. 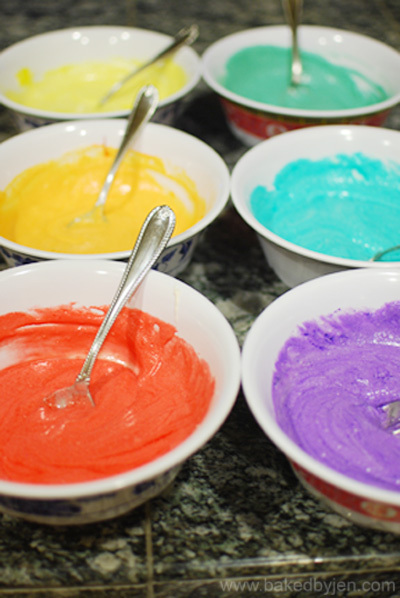 To save myself time, instead of baking six separate layers, especially given I only have 2 8-inch pans, I layered 3 different colors in each pan. I made sure to pour the batter of the top layer (red, orange, yellow) in reverse order because I knew I would flip it over when I stacked/frosted the cake. This cake definitely brought back a lot of cake methods/tools I haven't used for awhile to save on some time as I have been busy. 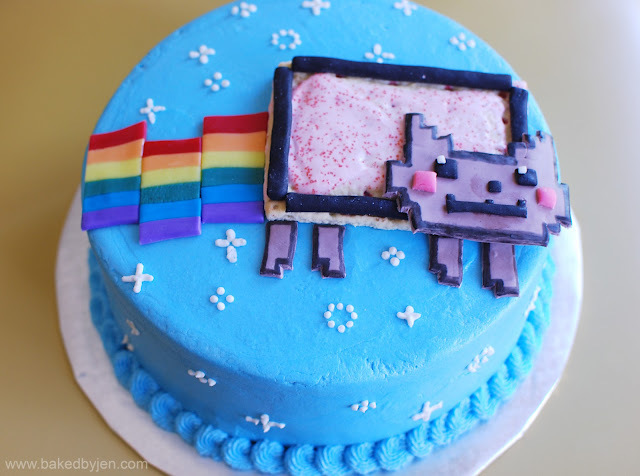 Come to think of it, I haven't made a decorated cake for quite some time! I used my tylose powder/water glue to hold the fondant to the pop tart. I used the paper towel method to smooth the frosting. I used food color markers to outline the cat for the 8-bit look. I used my clay tool for all the fondant pieces that required even lines. My maid of honor and my bridesmaid hosted a beach themed Bridal Shower for me over the weekend. They threw me an amazing party; there were plenty of delicious food, fun games, and great company! One thing I had to squeeze in was a request to bake something myself. So, I made madeleines for the favors. Place sugar and lemon zest a bowl. Using your fingertips, rub sugar and lemon zest together until sugar is moist and fragrant. Add eggs and whisk until mixture is pale and thickens slightly, about 2 minutes. Whisk in honey and vanilla. Alternatively, this can be done in the bowl of an electric mixer fitted with the whisk attachment. Gently fold in flour mixture in three additions; fold in melted butter until fully incorporated. Stir in milk. Batter should be smooth and shiny. Press a piece of plastic wrap against the surface of the batter; transfer to refrigerator and let chill at least 1 hour and up to 2 days. Butter and flour a large madeleine pan. Spoon a heaping tablespoon of batter into madeleine pan; transfer to refrigerator for 1 hour. Place a heavy, large baking sheet in oven; preheat oven to 400 degrees. Place madeleine pan on preheated baking sheet. Bake until golden and big bumps on top spring back when touched, 11 to 13 minutes. Remove pan from oven and immediately release madeleines from pan by rapping pan on counter. If any stick, use a butter knife or fingers to help release. Let cool on a wire rack. My go to dessert have been bundt cakes lately. They are very versatile as I have already made a chocolate and lemon one. They are also quick and easy to put together as well. Given it's strawberry season, I decided to throw a few into this classic pound cake and it turned out beautifully. 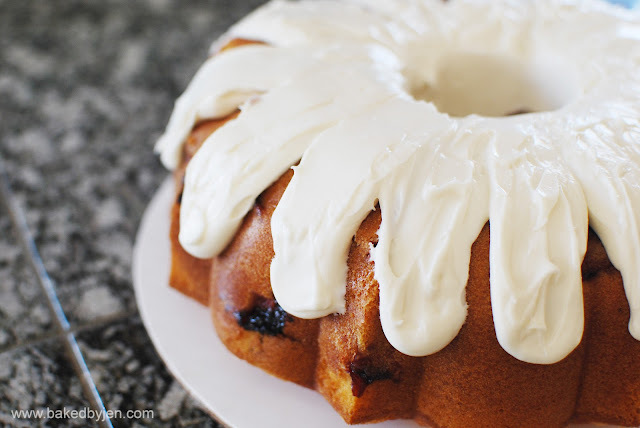 Butter or spray with a non stick vegetable spray, 2 loaf pans or 1 10-12 cup capacity bundt cake pan. Line the bottom of the loaf pans with parchment paper and butter or spray the paper. In a liquid measuring cup, whisk together the eggs, milk, and vanilla extract. In the bowl of your electric mixer, with the paddle attachment (or with a hand mixer), place the dry ingredients (flour, baking powder, salt, and sugar) and mix on low speed for about 30 seconds or until blended. Add the butter and half of the egg mixture. Mix on low speed until the dry ingredients are moistened. Increase the mixer speed to medium and beat for about one minute to aerate and develop the cake's structure. Scrape down the sides of the bowl. Gradually add the remaining egg mixture, in 2 additions, beating about 30 seconds after each addition to incorporate the egg and strengthen the cake's structure. Stir in the diced strawberries. Scrape the batter into the prepared pan and smooth the top with an offset spatula or the back of a spoon. Bake for about 55 to 65 minutes or until the cake is golden brown and a toothpick inserted in the center comes out clean. If you find the cake browning too much as it bakes, cover with a piece of lightly buttered aluminum foil after about 30 minutes. Combine the cream cheese, powdered sugar, and vanilla in a medium bowl. Using an electric mixer, beat until smooth. Add milk sparingly to achieve the desired consistency. Finally got around to tackling puff pastries. I did "cheat" a little by using a few shortcuts. I advise to really make sure the edges are sealed as quite a few of mine bursted open. They were delicious nonetheless. In a medium pot, combine the first 6 ingredients and mix well. Cook on medium heat until tender and syrupy; about 10 minutes. Allow to cool in refrigerator for 1 hour. Place squares onto a sheet tray lined with parchment paper or a silpat mat. Brush the edges of the square with the beaten egg. Place about 2 tablespoons of filling in the center of the square, leaving 1-inch on all sides clear. Repeat until all the puff pastry is used. Fold the turnover into a triangle and using a fork, crimp along the edges making sure to enclose all the filling in the pastry. Brush egg wash on top of each triangle. 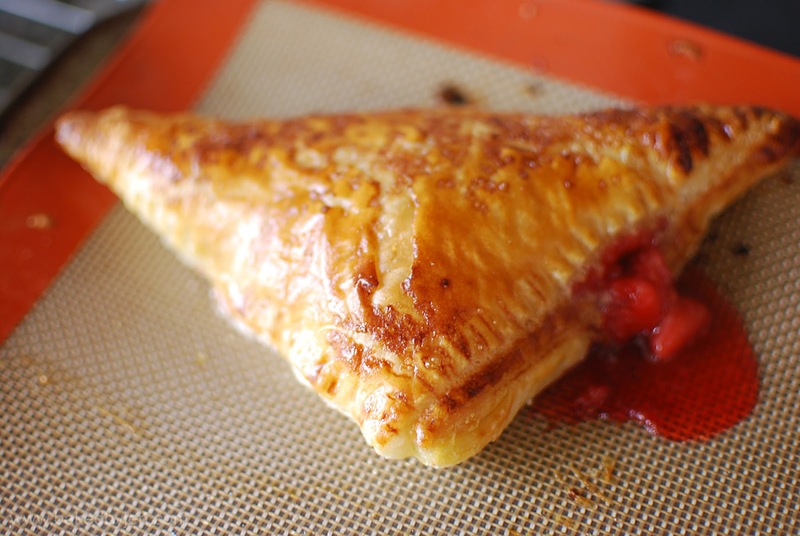 Sprinkle turnovers with clear sanding sugar. Bake the turnovers until puffy and golden brown, about 8 to 10 minutes. Let cool on a wire rack.